Free Printable Minions Chore Chart. Free Printable Minions Chore Chart, a great resource to asign basic tasks that kids can do to help at home. If your kids enjoy watching the Minions and Despicable Me movies, they are going to like this chart. Kids can help setting the table, feeding pets, making bed, watering plants, empty trash cans, help prepare food and more. You can use Minions stickers for a fun way to do daily chores. Save money by printing all the Minions Chore Chart you need for free. Includes 1 Chore Chart per page with Minions character in PDF format. 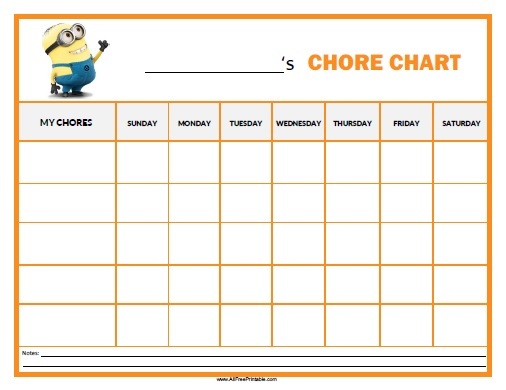 Click the link to download and print the Minions Chore Chart template free.